Leave the city behind…. 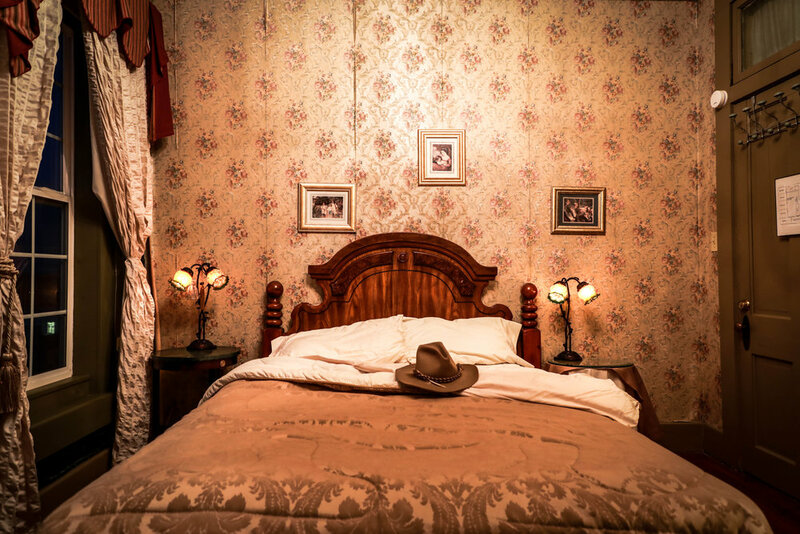 Take a relaxing drive through the country to Coupland Inn and Dancehall, enjoy dinner in the restaurant and dance the night away in the dancehall on our huge dance floor and finish off the evening by staying in our unique 1800’s wild west brothel style Bed and Breakfast. There are seven rooms, each with it’s own elegant style and décor, reflected in their names – Scarlett Room, Violet, Bonnie Blue, Duke, Bunkhouse, Rose and Amelia. All rooms have a queen sized bed, shared bathrooms/showers and 1500 sq ft of living and dining community space featuring squeaky wood floors and soaring Tin ceilings. Room and Board is $135 a night per room.. There are 7 rooms available. Check in time is 5:30pm and check out at noon. Continental Breakfast is available in the kitchen area of the Inn. Please check availability below and book your room online. Check in at the restaurant when you arrive for keys and a grand tour. To reserve a room, find the date you'd like to stay below and enter number of rooms you'd like to book. ( 1 for one room, 2 for two rooms etc up to 7 rooms) Online booking is not available after 3pm on Friday and Saturday. Please call 512-856-2777 for availability day of stay. Reservations are NON REFUNDABLE within 10 days of reservation. No pets please, Tickets for events are not included with B&B reservations. Please purchase separately on the event listing page.